The trick here is to find fresh shrimp; I mean shrimp that have not been frozen. For this, it’s probably easiest if you move close to a shrimp producing body of water. That may not be so practical, but every once in awhile I can find them. Sometimes in NY’s Chinatown at a fish wholesaler, but the other day I scored at the Citta di Castello fish market. These babies were gorgeous! They were huge, and with the most delicately colored tails. 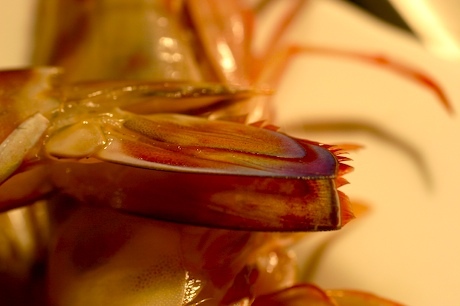 Should you come across any fresh shrimp, try this. If you only have regular shrimp available, give it a try as well, and let me know how it works. Take a bunch of parsley stems, or the whole parsley sprig and layer the bottom of individual ramekin type dishes with a good half-inch of parsley. Cover the parsley with white wine, then cover the dishes with foil or a lid and poach the parsley for 20 minutes in a warm oven (300-325 degrees). When it’s time to cook the shrimp, give them a little dusting of salt and pepper and arrange in the poached parsley dish with a pat of butter on top. Reseal the dish and poach the shrimp for as little time as possible, maybe 3-5 minutes. 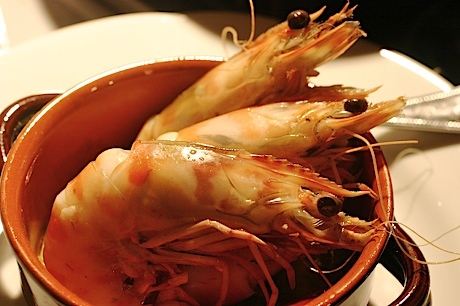 Particularly with the fresh shrimp, you want them barely cooked to enhance the natural sweetness. Serve with a wedge of lemon, some bread to soak up the juices, a crisp cool white wine, like a Grechetto, and some soft Brazilian style jazz in the background.